Our family loves reading!! We are always on the lookout for wholesome, character building books to devour so today's review meets that criteria and more. I would place it into the category of historical fiction so even more bang for your buck. Circle C Milestones is a series of books published by Kregel Publications following the adventures of Andrea Carter also known as, Andi, as she heads straight into the ups and downs of becoming a teenager. 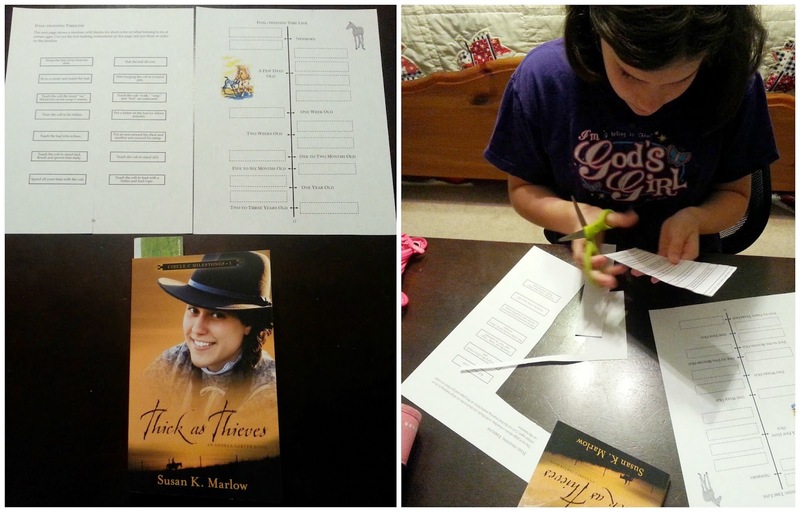 We received the first book in the series, Thick as Thieves and we're already looking forward to the second one set to be released in July 2015, Heartbreak Trail. 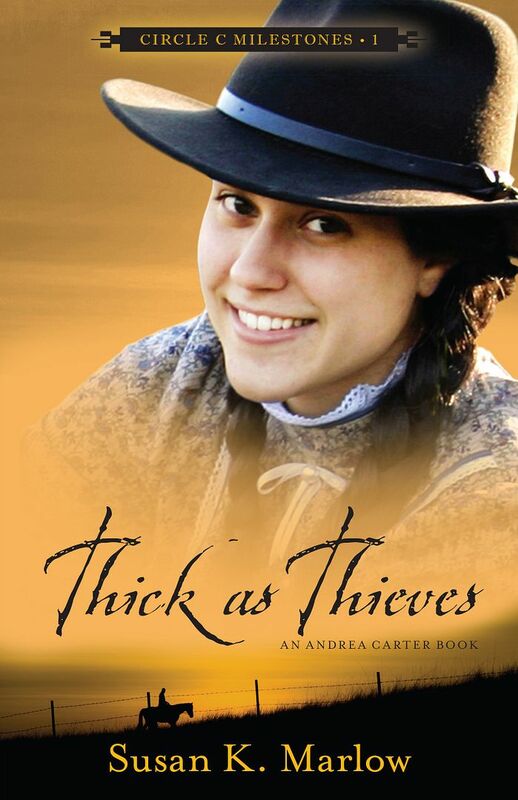 Thick as Thieves is a paperback book with 176 pages and 26 chapters. It is recommended for ages 12 and up. My daughter and I read the book together out loud. I would say that the book would appeal mostly to girls but I have to tell you that as my sons would walk by as we were reading, you would here them chuckle and stand around the door to see what was going to happen next. They really enjoyed the vibrant character of Macy and I really enjoyed allowing myself to find her character as I would read. The setting takes place in the late 1800's in California and centers around Andi. She lives on the Circle C ranch and helps out with the daily tasks of ranch life as much as her mother will allow. The beginning opens as her favorite horse, Taffy, is about to give birth. She would prefer to stay at the ranch all day but has to head off to school instead. Not only did that have her spirits down but when she arrives at school, the new girl, Macy Walker, is assigned to sit beside her. As I said earlier, Macy is a wild mess and as the story unfolds we were all on the edge of our seats to see how the relationship of these two would end up. Family trials are also a part of Andi's days as their ranch is being hit by cattle rustlers. I won't spoil it for you, but there was plot twist that neither of us was expecting! Sarah, my daughter, and I have decided we really want to go back and read some of the other books and series now. Each series follows along with Andi as she grows but they aren't needed to fully understand the story line of the book. Author Susan K. Marlow has such a fun and wonderful way of writing that shines through in this book. She also has a fun blog where she shares stories written from readers, fun trivia, photos, and more. Thick as Thieves is written from Andi's point of view making it extremely relatable. My daughter who is 11 and a little younger than the recommended age had no trouble reading this at all. We both think any girl would love it. The central theme of the book all comes back to friendship and Scripture verse 1 Peter 3:8 is recommended for memorization. Andi often quotes Scripture verses through out the book as well. You can read a sample excerpt here. Also available for free on the website is a 40 page downloadable Study Guide that includes many enrichment ideas from comprehension questions, vocabulary activities, writing assignments, crossword puzzles, Scripture memory posters, and more. It's divided up into 6 sections with the 2 recommendations for using it. You can read the whole book at once and then go back to do the study guide. You could also read the chapters assigned to each section and incorporate the study guide all along. We chose the 2nd option and decided to pick and choose which activities we were interested in most for each section. I loved that it included an answer key. 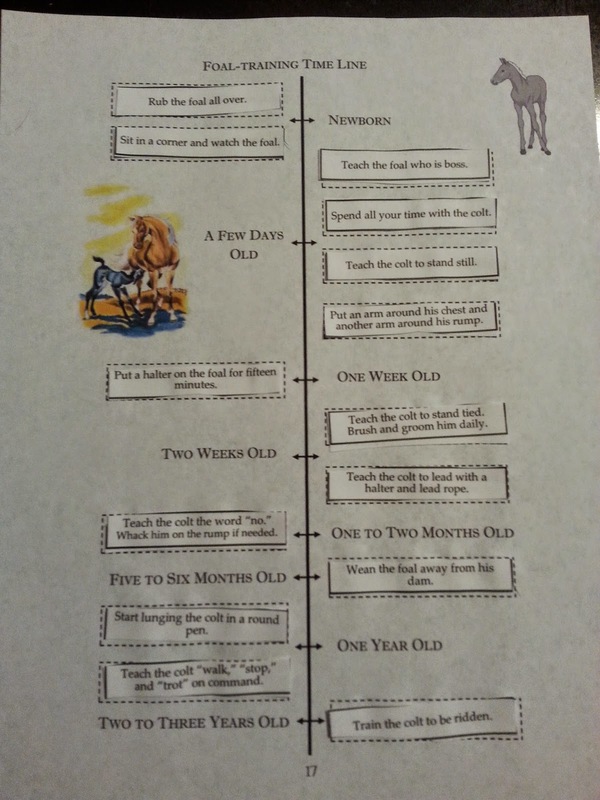 Here is a sample of a timeline we prepared on how to train a foal. Find out more on on Circle C Milestones by visiting their Website, Facebook, or Twitter pages. I just love the fact that we get to grow up with Andi! Thank you for enriching our lives with these books!